These brownies are the brainchild of Ina Garten – huge, wonderfully rich and complete with tons of chopped walnuts! 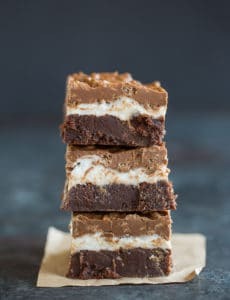 I first made Ina Garten’s outrageous brownies recipe only a few short months after I launched this website; I had originally halved the recipe and I’ve been wanting to make the full recipe for some time now. Something about an entire half sheet pan of brownies sounded way too good to pass up. Mission accomplished! 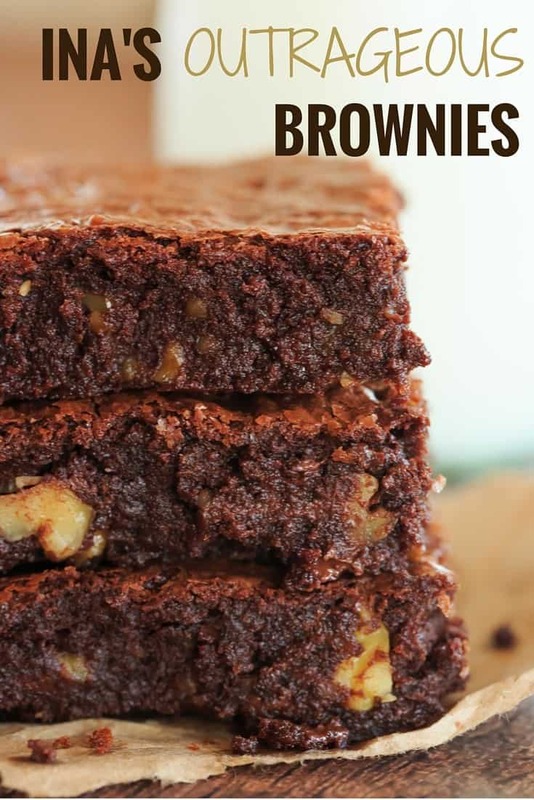 At the time, I had read so many crazy wonderful things about this recipe on cooking and baking forums that I frequented and these outrageous brownies in no way disappointed. They are super rich, packed with chocolate and include a substantial amount of chopped walnuts for good measure. Yes, this recipe calls for one pound of butter PLUS one pound of chocolate PLUS six eggs. 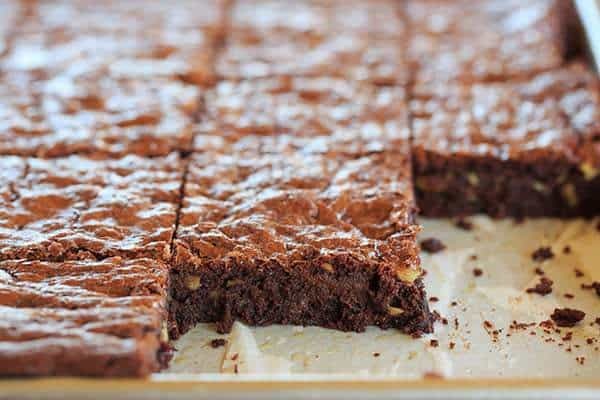 These brownies are rich, and the half sheet pan makes an enormous amount of brownies. While Ina’s recipe calls for cutting this recipe into 20 large brownies, I think that’s a bit overkill (even for me). You can easily get anywhere from two dozen to 40 brownies depending on how you decide to cut them. Last but not least, definitely refrigerate these! 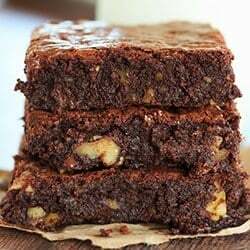 They transform from really soft brownies to firmer, fudge-like brownies and you can really appreciate the addition of the chocolate chips when they are chilled. The refrigeration is definitely not optional as far as I’m concerned! Grab a glass of milk and dig in! 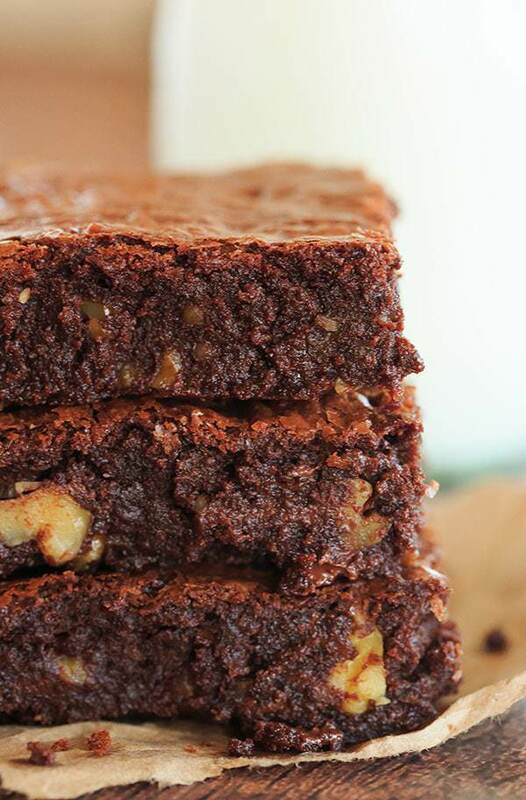 These are the super rich brownie brainchild of Ina Garten, complete with tons of chopped walnuts! Preheat the oven to 350 degrees F. Grease and flour a 13x18-inch rimmed half sheet pan (or grease and line with parchment paper). Place the butter, semisweet chocolate and unsweetened chocolate in a medium bowl and microwave on 50% power in 30-second increments, stirring after each, until completely melted and smooth. (Alternately, you can also melt the butter and chocolates in a double boiler on the stovetop). Allow to cool slightly. In a large bowl, stir together the sugar, eggs, and vanilla with a wooden spoon. Stir the chocolate mixture into the egg mixture and allow to cool to room temperature. In a medium bowl, sift together 1 cup of flour, the baking powder, and salt. Add to the cooled chocolate mixture and stir gently with the wooden spoon until mostly combined. In a medium bowl, toss the walnuts and chocolate chips with the remaining ¼ cup of flour, then add them to the chocolate batter and stir until totally incorporated. Pour into the baking sheet and spread into an even layer. Bake for 20 minutes, then rap the baking sheet against the oven shelf to force the air to escape from between the pan and the brownie dough. Bake for an additional 15 minutes, or until a toothpick comes out clean. Allow to cool thoroughly, then refrigerate for at least 1 hour, and cut into 20 large squares. 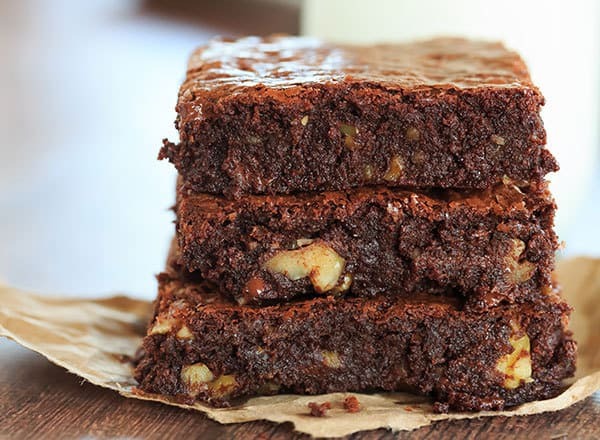 Leftover brownies can be stored in an airtight container in the refrigerator for up to 1 week. Note: If you would like to access the halved recipe that I had originally posted, you can find it on Two Novice Chefs, One Tiny Kitchen. This recipe was originally published on October 9, 2007. I am unable to go to the website for the halved recipe. Can you send another link. Thanks so much, love your site! How should I adjust recipe if I want to omit the nuts? Hi Carol, You can just omit the nuts without making any other adjustments. Enjoy! 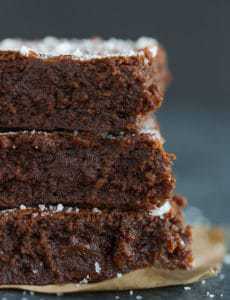 How could I incorporate chocolate stout to the outrageous brownie recipe? Any ideas? I make these all the time. However I only use half the amount of butter and add a 1/4 cup cream cheese. I also do not add the additional chocolate chips. Hasn’t changed the consistency at all. You can actually take a bite without leftover butter grease around your mouth or hands. These are, without a doubt, the best brownies I have ever made/tasted. I loved the dimension that the two chocolates created, and the walnuts gave them such a nice chewiness. My family was obsessed. This is definitely my go-to brownie recipe now. I used a 12 x 16-1/2 x 3/4″ pan, 6 “large” eggs, eliminated nuts, added 1 tbsp “espresso” to melted chocolate instead of using instant coffee. Baked 20 minutes, rapped pan 5 times (to be sure), baked only 10 minutes more. Thank God, a good, moist and chocolately recipe from Ina. Thank you much. Hi Janice, It’s the correct amount, this is an entire half sheet pan of brownies. I’ve made the recipe countless times as written and it’s always turned out great. Can I use self-raising flour instead of all-purpose flour and baking powder??? Hi Vanessa, I would not recommend it, since it would be impossible to know how to alter the leavening. I just updated it with metric measurements where cups are listed. I’ve been doing this on new recipes, but am still working on getting all of the old ones done! Please email Ina Garten’s brownie recipe to me. I love good and easyrecipes for cookies and bars. By mistake I melted all the chocolate chips…. 1 pound Plus 12 Ozs. Plus 4 ozs.of unsweetened squares plus 1 pound butter. Have I ruined the recipe? I am letting the chocolate cool. Hope you can up help me! 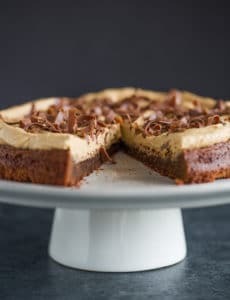 How do I make this recipe more “cake like”? Do I add more flour and less chocolate and butter? I don’t know. You tell me. Hi Matthew, Honestly, this recipe is nowhere even close to cake-like, so I would recommend looking for a cakey brownie recipe. I think you would have more success. I don’t have any on the site, as I definitely prefer the fudge-like brownies. These just came out of my oven, and I’m having a really big challenge in allowing them to cool before sampling “just 1″ ;) I do have a question: the recipe says 1 tablespoon of baking powder, and one of the first few comments questioned that amount, to which you replied 1.5 teaspoons . . . I’m not sure which amount should be used, but I decided to go with the lesser amount (since you don’t have a helpline to call ;) ). Judging by the way these look once baked, I think the 1.5 teaspoons is sufficient, but I don’t know since I haven’t cut into them. Also, I baked mine in a 9x13x1” pan, which I lined with parchment paper. I think that’s a good sized pan for this recipe as written, but I would highly recommend using parchment to line the pan as it seemed to keep what would have been a slight spill-over of batter in the pan. So . . . which is the correct amount of baking powder to use, and what about pan size? Thanks, Michelle! Hi Michelle, So I had originally posted this as a halved recipe and then updated it. For the half recipe, 1.5 teaspoons was correct; for the full recipe you need the 1 tablespoon as indicated. The correct pan for the recipe as written above is a 13×18; if you make a half batch, then a 9×13 will work. You forgot the coffee powder!